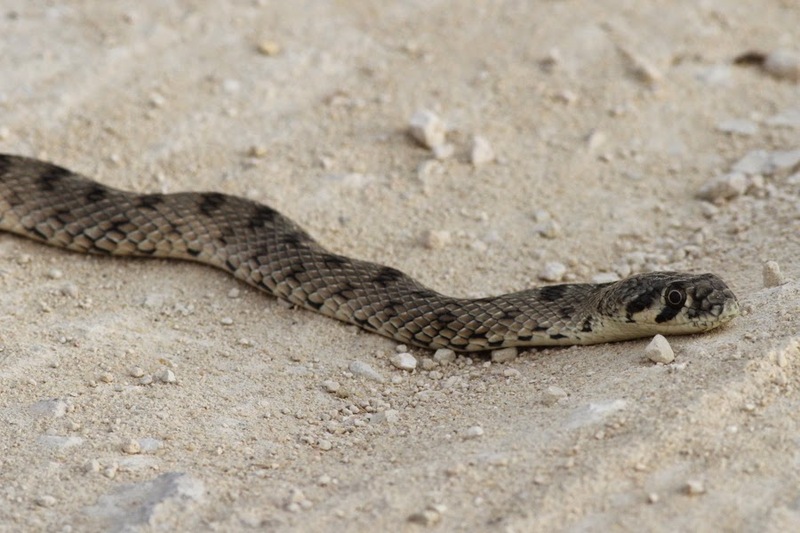 Dave Kimister sent me this photo of a snake some time ago, and has kindly allowed me to use it on my website. The snake appears to be a Glossy-bellied Racer or Hardwicke's Rat Snake Coluber ventromaculatus. This is a species of rat-snake or racer that occurs from from north India to south Turkey, Pakistan, Afghanistan, Uzbekistan, Iraq, Iran, Jordon, Kuwait, Bahrain, Saudi Arabia (along the Arabian Gulf sea) to Palestine. It is a fast active and graceful snake with smooth, round, elongate, gradually tapering body with the tail more than one-fourth the total length and has a moderately narrow head. It ranges from grey, olive-brown, olive-green or dirty yellow and has a series of black rhomboidal cross-bars on the back. The scales forming the cross-bars normally have colour on the edges only. With the sides having similar smaller spots alternating with interspaces which may be broader or narrower than them. The belly is yellow to white with glossy scales. The head is of the body-colour with or without symmetrical darkish markings including a blackish spot between lores and a black streak obliquely placed below the eye. A black stripe also occurs from the temporal area to the gape. A cross-bar and two stripes occur on the nape. Adults are usually 90 to 120 cm in length and have been recorded to grow up to 1.28 metres and they inhabit mainly open country with stony hillsides and open or cultivated land. When alarmed it quickly retreats into cover.